Okay, so you don't know what to do with those straps that you've cut off your bag? 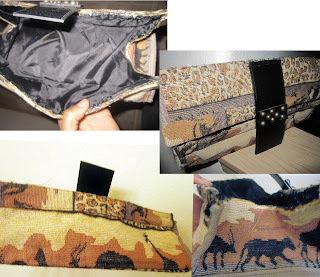 Well, here's what I did with the pieces leftover from the animal-inspired clutch that I made the other day. I transformed the handles/straps into mini (cuff-like) bracelets! Additionally, a second clutch was also created, because my younger sister wanted one, so I decided to make the version of her's a bit more sleek than mine, however still having attitude. Enjoy and see below. *Don't like reading much? Skip to results below! Flat elastic 3pcs. cut 2-3" length/ea. After the cut measurement of your wrist to where it's as tight as you want the cuff to be take chain and lay 2 or 3 pieces in a desired design. Carefully glue the chain to the fabric, you may also use tweezers for placement if you have a shaky hand during application. I used a mixture of fine chain this time because I wanted three separate rows. Afterward the drying process takes place and it's time to add a snap, button or Velcro for closure. However, instead of those stated I decided to create a braided elastic method. To do this you'll need the cut measurement of elastic and start braiding the pieces together, if you like go ahead and place tape on one end until the other is finished. On right side of fabric to right side of braided elastic (=face to face) join the seams together. Cut excess closely, then flip cuff over and top-stitch to secure strongly in place. Repeat this for the other side of the elastic. That's it! 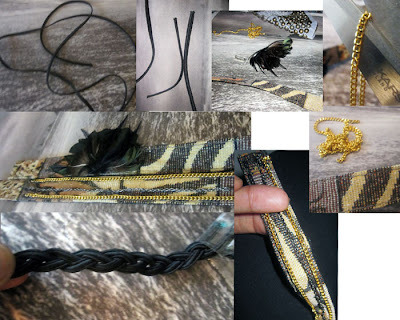 For the second bracelet, I used more feathers from the Ladyofashion archives, and placed my selected design in the center of the strap/handle. Make a center stitch to tack in place, then use a small amount of fabric glue to adhere the feathers to the strap/handle. *Repeat the closure process as above. I used a manual braided elastic here as well, giving it a unique look. Here's the result! This clutch was from the bottom part of the initial bag, it needed depth to whatever design I was going to choose. Making a simple adornment by using printed pleather attached to a vinyl piece I cut the pleather to the length of the clutch (minus 3/8" total) and a separate piece approx. 6cm or so... This will be the added piece for a dimensional effect. Top-stitch the pleather (above used as a center focal point) to the clutch Using studs that I already had from a previous project, I adhered them to the separate piece (use metal glue or hot-glue). Of course studs and other adornments may be acquired at your local arts and crafts store. All seaming was pretty much done, the main thing was to create a lining, becasue it had to be pretty much torn out for the initial clutch. Use a sewing machine to stitch lining on the inside straight to the clutch or you may use fabric glue if you prefer. I sewed mine. I also have an additional strap piece from the bracelets and used it as a binding piece sewn at the top and bottom of the clutch openings. For closure, I used magnets, but you may also use buttons, Velcro, or snaps, etc. Mission: To use all of the fabric from project: Mission complete. Uhm, this is amazing. I can't believe you made these!!! how creative and it looks stunning! Your feather cuff is so awesome - i'd totally rock that! i need to get into creating things like this myself love the cuff! Ooooh, I totally need that feather cuff in my life! Madison you're so thoughtful and creative! 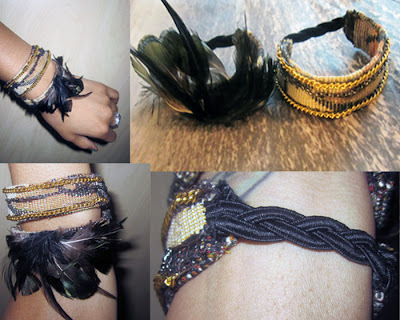 I adore the bracelets, specially the feathers one! Good idea to use the straps as bracelets! I love your no waste mentality!!! Great job! I love the bracelets, great idea! That's so clever! I love re-purposing! haha! yes, you know me just creating away! I love making things hon; give me glue, paper and rubber band, fantastic art will happen. hehe! Waste not want not... haha! Thank you for noticing, yes especially for this particular project I really wanted to use all of the material. Aren´t you clever. What an inspiration, my dear madison. What great textures and a creative use of those straps - very cool! This is amazing! so crafty! and what a superb look. loved the clutch and the diy jewelry is even better! Love the feathered bracelet! Gawsh, Mad!!! You are amazing at diying! 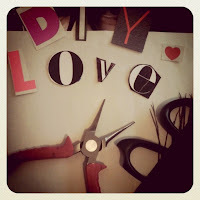 I'm so happy you are also doing no waste diying :). The bracelets came out great and I would love to own the original clutch you made! awesome job! love the feathered one. *Oooh, I may need to make you something... after I get settled. What a great idea. I love this DIY. I am looking for a project to try and use up some pieces of fabric that I have from shortening clothes. aww, I really appreciate the sweet words Claire. I enjoy creating things. Oh hello and Welcome Anita! Thank you very much! Hello & thanks! Have a lovely day! Thanks Ofelia! Feathers are always a favourite of mine. Hi Kavery, for me using everything was key for this project. So glad that it worked! Thanks so much! *Yes, Blogger's "Google connect" has been unpleasant lately.